Towards the end of last year I had had an absolute enough of punctures, I was getting them almost each time I got on my bike to ride to work and sometimes I would have one on the way there and then another on the way home. Once I even had two on the way home and was so fed up that I walked into a bike shop and bought a new inner tube and asked the boys to fit it for me. As my journey to work is 14 miles you may understand why this was becoming tiresome. So, the guys at work started telling me about the toughened tires that you can by, specifically they were signing the praises of the Continental GatorSkin Tires which are the ones that I know own. But there are many types of brands that manufacture the Kevlar lined tires that are compatible with the Continental brand. Though I was still a little unsure and skeptical about these tires especially the investment I would have to make, I did it because I could not bare the thought of another puncture too or from work ever again. 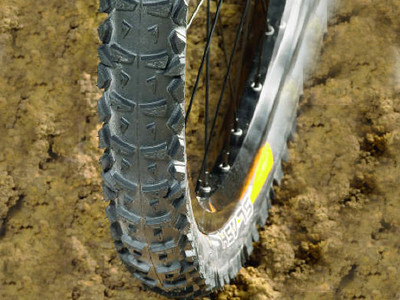 At the same time as ordering the tires I also opted for new inner tubes so that the whole package would be new and there would therefore be no weak point. The tires arrived and though they were tough to fit, I used a little talc to make sure that the two would not stick, now I have absolute confidence in my lovely bike and once more I feel that I truly love riding my bike. Its been one month now and I've not had to pump up my tires because they are sound, it's a joy to ride to work if not very tiring but I finally feel confident that I do not need to leave early and that I've no longer waiting for that little hiss to work its way out of the tire. For more information about Kevlar Bike Tires and the Puncture Resistant Tires check out my other articles.